Techno Post will cover most any technology trend along with the occasional healthy dollop of politics and environmental news. It will be the most unbiased blog gently nudging you into seeing my way. Sure there will be level tech reviews, but also opinion pieces and even the occasional narrative because sometimes the best way to get a point across is not just traditional journalism. Most people in my family know I have a history of tinkering. 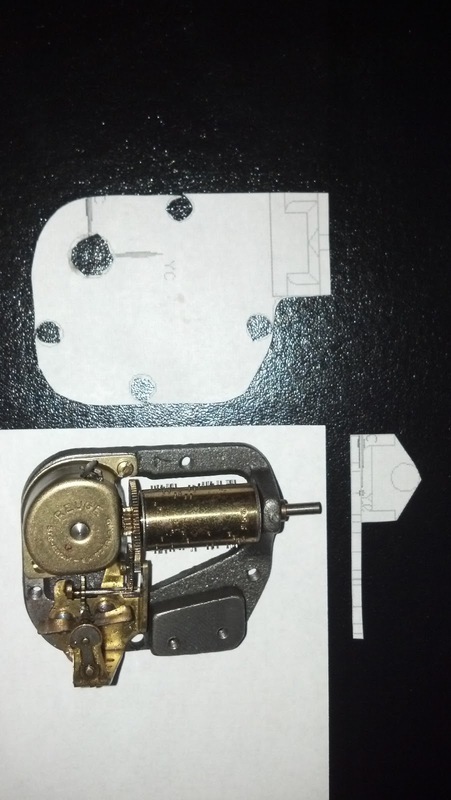 Recently, my wife's aunt asked if I could "fix" a music box. I looked at it for a minute and told her I would attempt to, but did not want to make promises. The first object I ever took apart was a Super Nintendo that no longer would function by literally breathing life into its cartridges. Parts were laid out in lines; as organized as possible on the basement carpet. Several screws and miniature plastic parts were cluttered around me. It got put back together. Strange thing was that it worked less than it did before. I never understood what the difference was. I think all the parts got put reassembled. Throughout the years I started taking apart other things. Toy robots are the most fun and have the most inventive designs. Printers had the most salvagable parts. It was always things that had come close to being disregarded anyhow, but the track record of things becoming functional after the fact was not great. 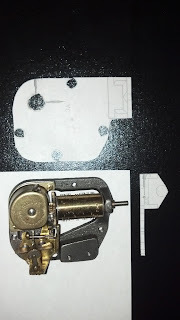 So now my latest challenge would be a music box. Diagnosis: It was over sprung. To get the spring unsprung was going to require a complete tear down; my specialty. Once that was accomplished I inspected the individual parts for further damages. It was worse than I thought. The main gears would not align because the gears moved on the shaft. It all sat loose. Extra holes were drilled into the box from the bottom. Someone else has attempted to fix this box. I tried moving the gears back in place on the shaft but could tell it was bending. Without proper tools, a different approach was decided. Whoever tried to fix it before put an 1/8" piece of wood under the mechanism. My alternative was to design a part to replace the piece of wood. The part would also incorporate a feature to hold the shaft in place. It also gave me a chance to test out a 3D printing website. Shapeways has basic modeling tools available on their website. Once modeled the part can be loaded on their website as private or publicly viewable. Similar to sites like Etsy, the items can be sold in an online market place. The model can be viewed and embedded conveniently so it can be sold or displayed through other venues. 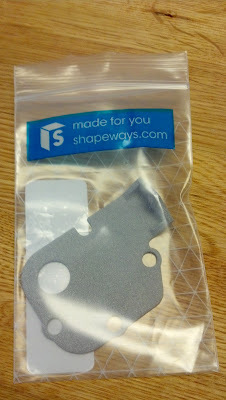 Shapeways has a variety of materials to choose ranging from flexible plastics to precious metals. I went with a form of aluminum. To verify my model I printed a a template. Once I felt comfortable with the design, I placed the order. It arrived a couple weeks later. The part arrived in the box below. 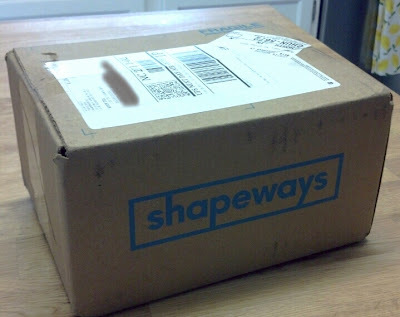 As such, here is my first blog unboxing. When first opened, the initial presentation is a card to make you feel good about the purchase. Generally good content, but the heart diagram is a bit cheesy. 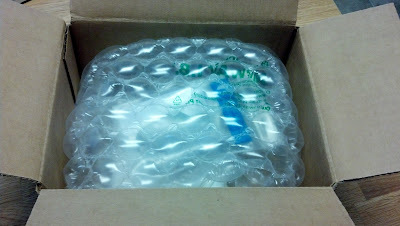 Underneath the card there is ample bubble wrap protecting the purchase. 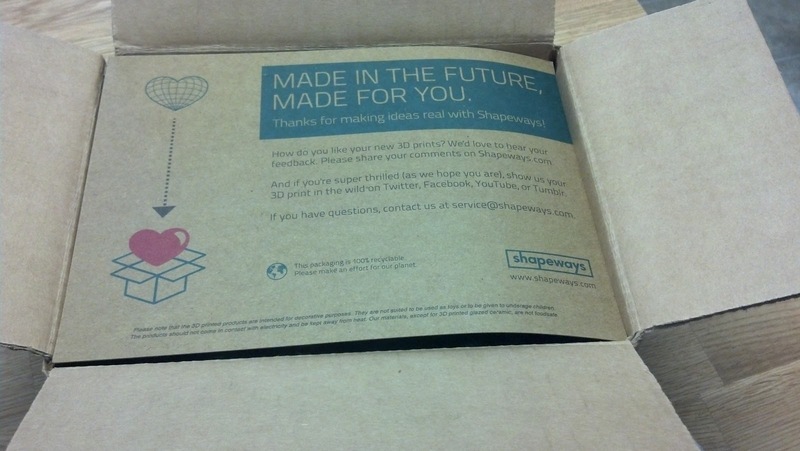 The card gives a nice touch so it feels like more than just a part shoved in a box. It is a totally different display compared to if the bubble wrap is the first thing seen. 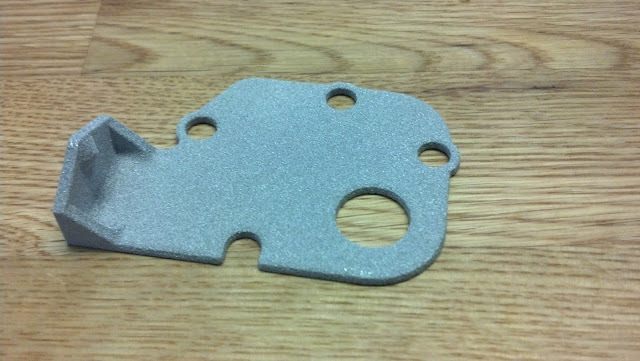 This photo shows the texture from a 3D printed aluminum. The website has plenty of documentation to describe the strength and look of their different materials. 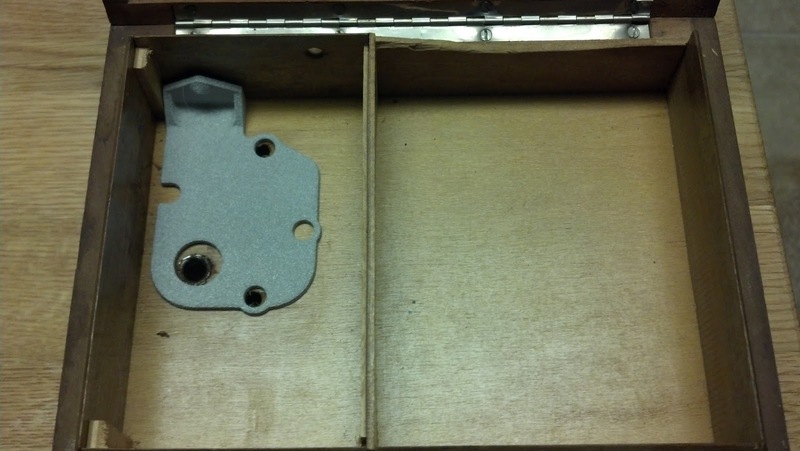 Here is the part in place in the music box.The raised feature on the hinge side is what holds the shaft in place. Once it was in place I added some oil that would be for a model train for good measure. Finally, I could reap my reward and hear the song.